… but not the magi of Bethlehem in Matthew 2:1-20! We don’t know how many there were – tradition varies from the popular three to the less known twelve. 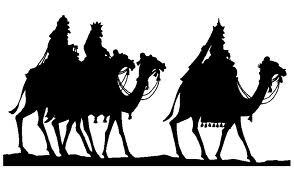 The magi are not described as “kings” – there are two kings in Matthews’s account – Herod and Jesus – and the nature of their respective kingdoms were (are) in conflict. Neither are the magi described as wise men – indeed this reference best fits the scribes and scholars urgently summoned by Herod to disclose what could be known about the Messiah sought by the magi. They represent the wisdom tradition of Israel. Matthew’s gospel goes on to describe the kingdom of heaven as “hidden from the wise and revealed to little children.” The kingdom of heaven invites its heirs to service of one another and thus of God (exemplified in Matthew 25). To the extent that the magi of Matthew 2 reveal these characteristics in the brief account of their visit, they are both wise and royal. The point of all this Christmas card iconoclasm? To let Matthew’s gospel say to us what it really intends to say. God is universally revealed in the human presence of Jesus right from his infancy. Those who approach Jesus with the clarity of simple child-like attention and a servant heart that eschews displays of power are the truly wise and regal. Greetings from Wordwise Hymns. Your post caught my eye because I posted an article on John Hopkins’ carol myself, this morning. I agree with much of what you say–though not everything. Wise men (or magoi, in Greek) is a word of Persian orgin, referring to men who were expert in the study of the stars. But you’re right that there are a number of inaccuracies in the carol–including an assumption about the number of wise men. However, the song has some merit in its explanation of the symbolism of the three gifts. (I don’t think they were chosen intentionally and knowingly by the men who came. But God’s providence overruled. Just a thought or two. God bless.